Subtitled The Life and Times of Jesus of Nazareth, Aslan’s New York Times #1 Bestseller takes a purely secular look at the historical Jesus to draw the apparently uncontroversial conclusion that he was primarily a Jewish political agitator. Complete with exhaustive endnotes and a seemingly endless bibliography, Aslan shows he has studied the available literature in many languages — original source material in Greek and Aramaic as well as scholarly works in English and German. 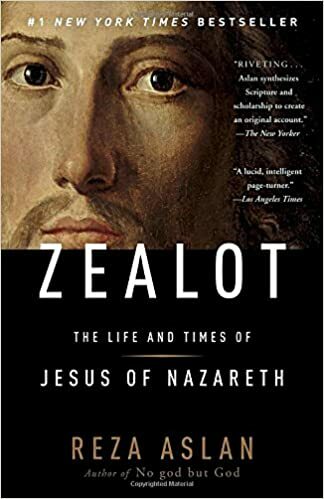 Because of its sometimes overly drawn out and mellifluous language, I don’t necessarily recommend reading Zealot unless the motivations of the historical Jesus in the context of his times and the evolution of his following is of particular interest to the reader. While not a novelization, the prose is both flowery and verbose, with chapters often repeating key facts probably with an eye to making them more independently consumable. Even so, the book is undeniably engaging and offers several profoundly interesting secular takeaways that help us to better understand how Jesus became the influential spiritual and religious figure he is seen as today. I offer a summary, or even a reorganization to taste, of the highlights.